End Falls is marvelous. 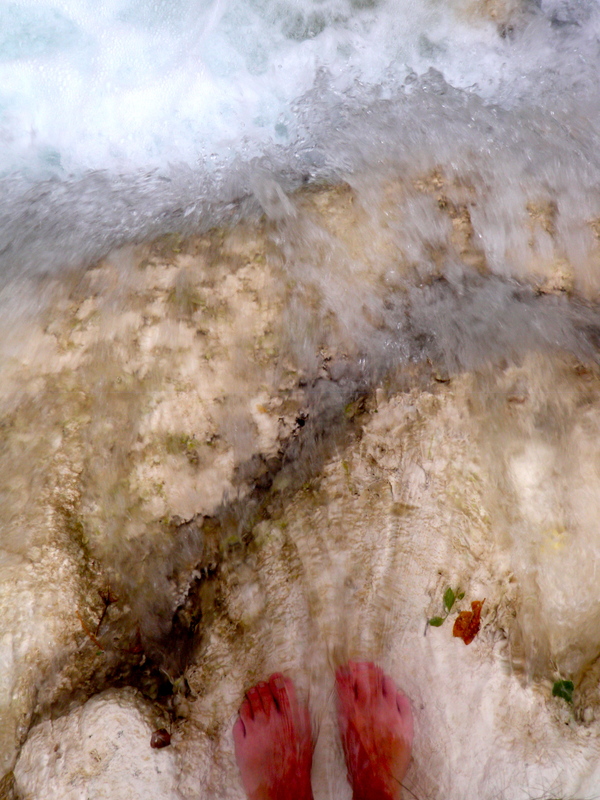 At 196-feet high, it’s taller than Niagara and although it only spouts a single jet, the travertine-laced water is almost supernaturally bright blue. 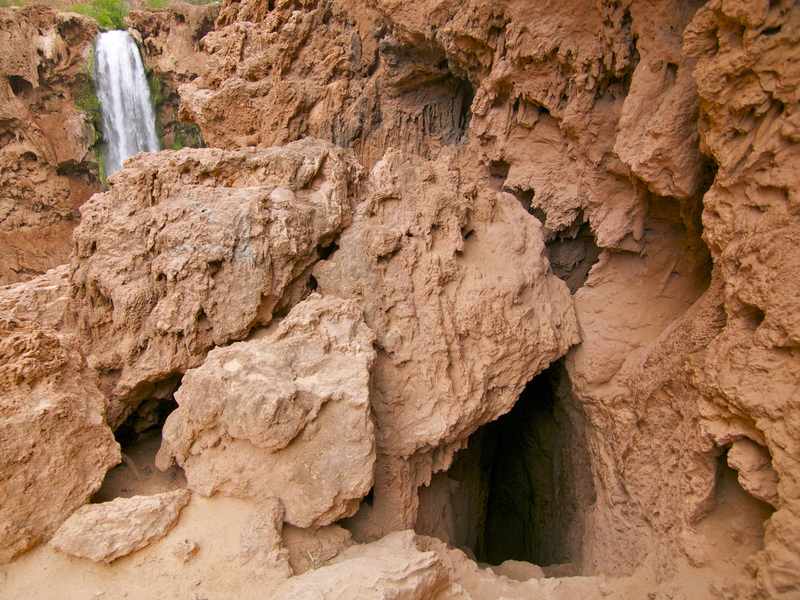 For centuries, End Falls marked the northern edge of the Havasupai homelands, since very few could descend the treacherous cliffs surrounding the falls. That all changed in 1882, when a prospector named Dan Mooney, seeking to explore potential mining claims below End Falls, fell to his death when his rope was cut by the sharp travertine fans surrounding the horseshoe-shaped cliffs. A year later, another miner named Mat Humphrey blasted a route down the cliffs, hammering spikes and chains into the rock face to aid his descent. He buried Mooney below the falls and established a mining claim just downstream. 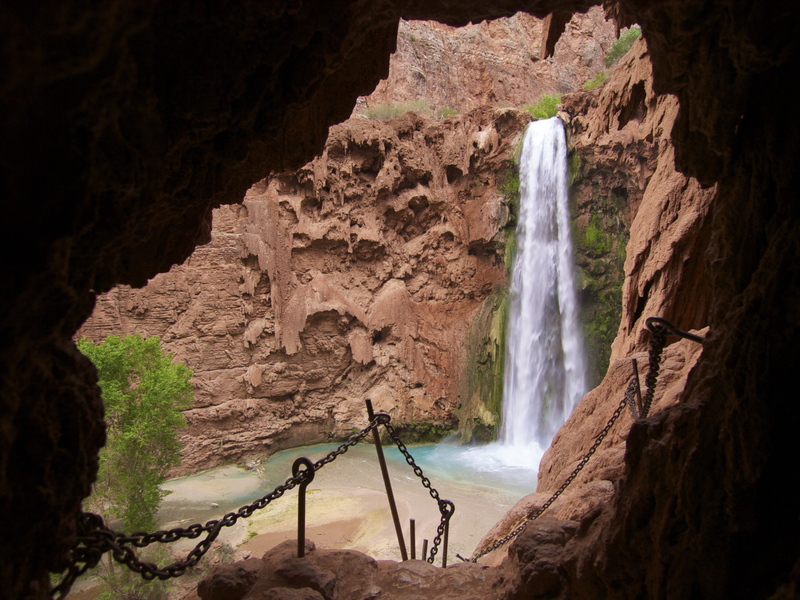 Humphrey’s route is still used today and the falls are now widely known as Mooney Falls. It is somewhat miraculous that Dan Mooney is the only recorded person to have died descending End Falls: even with the aid of chains and ladders, the descent is sketchy as hell. First, you have to divine the way down. We searched all along the steep drop offs looking for a path before I noticed footprints leading into a hole in the wall: a tunnel! The path led into another tunnel and then down a series of slippery steps cut into the rock. The Way Down: through the tunnel on the right! When moving through steep terrain, down is always worse than up. On the way down, you have to go backwards, feeling down into the abyss with your feet, stealing dizzying glimpses below. Humphrey’s chains and spikes gave me something to grip and I knew I’d be all right as long as I kept moving slow and steady. The going got worse farther down the cliff as the spray from the waterfall made the rust brown rocks and the chains slippery. 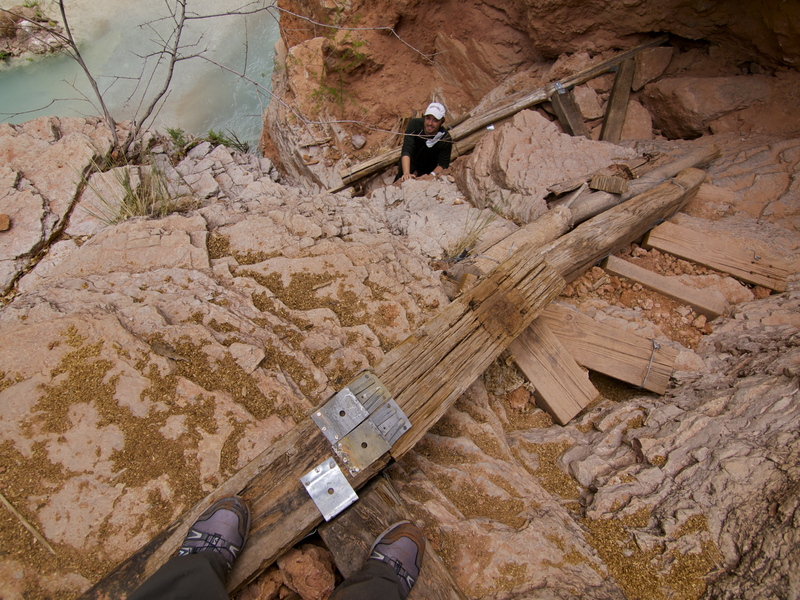 The worst part was transferring from the rock steps to the three wooden ladders, which were slick with mud and unsteady. By the time I touched solid ground, my legs were shaking and I had to pace back and forth for a few minutes to walk off my nerves. Going back up, as usual, was much easier. Me & Devin in front of End Falls, happy to have survived the descent! The next morning, we descended End Falls again to begin our hike down to the Colorado River. Deliberately, I had done very little research about the hike below End Falls, intending to have an adventure. I knew the river was about 7 miles away, but I had no idea what to expect along the way. 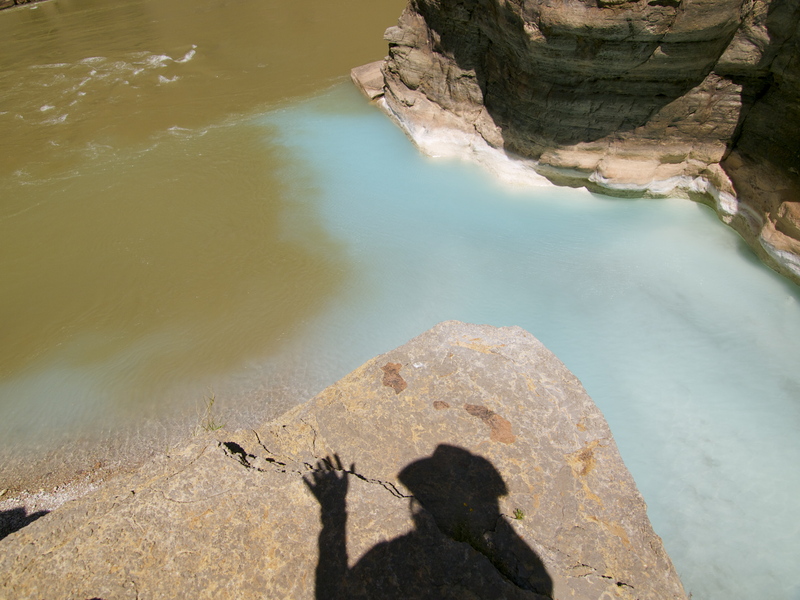 Since the trail runs along the bottom of a very deep canyon, it’s not really possible to get lost; there are only two directions: upstream and downstream. 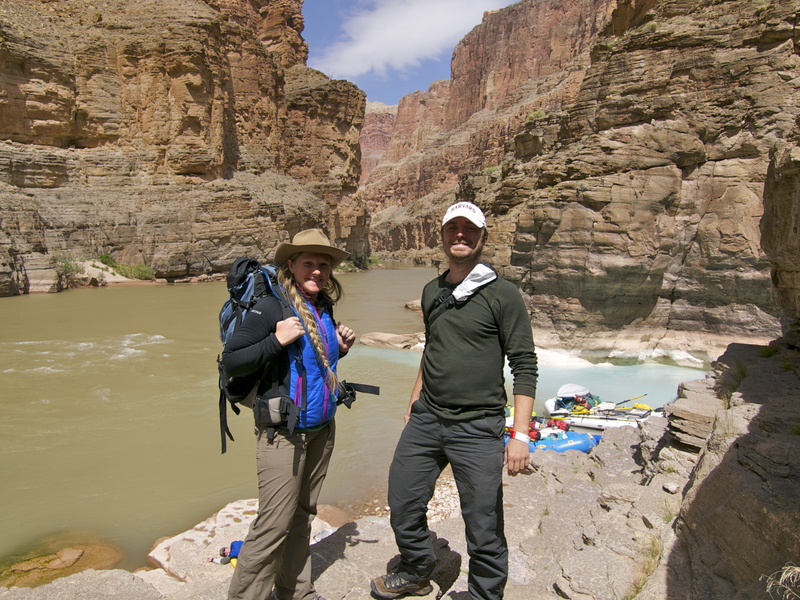 The plan was simply to hike, climb or swim downstream until we hit the Colorado. 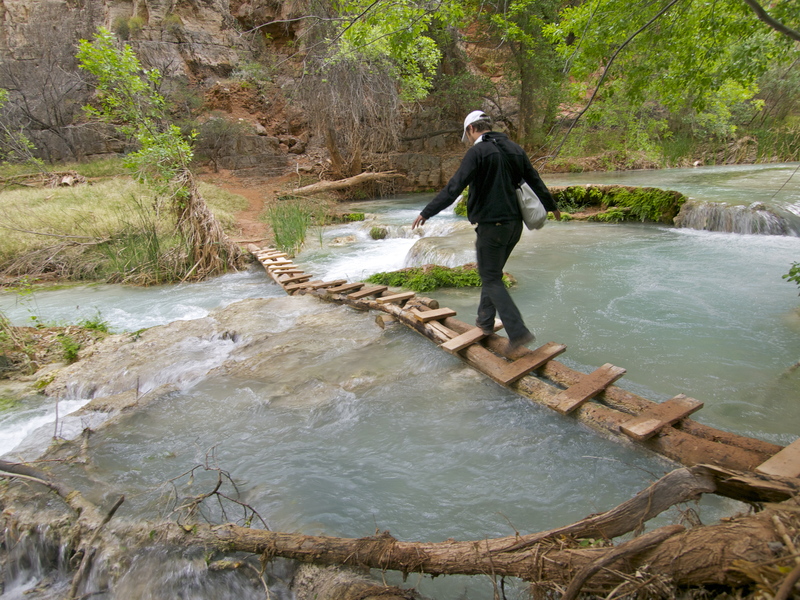 The first two crossings of Havasu Creek were deceptively easy: both were spanned by plank bridges. By the third crossing, however, we had to get wet. The creek was wide but shallow and we both took off our shoes, rolled up our pants and waded across. 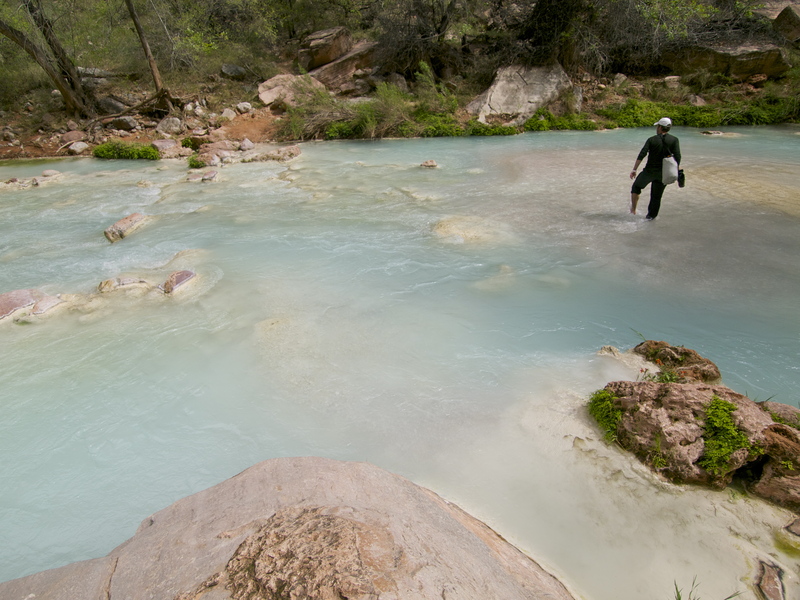 The white travertine deposits on the creek bed proved more sharp than slippery and I decided to leave my sneakers on for the rest of the crossings. Better wet feet than cut feet! Shortly, we spotted a pile of rocks stacked on top of a boulder on the other side of the creek, a cairn marking another crossing. Here the water was deep and fast. I scouted up and downstream, looking for a shallower spot to cross. I found a place that was deep and fast but not quite as wide and waded in, shoes on. Partway across, fighting to keep my feet in the strong current, I remembered my fluvial physics: the narrower the channel, the faster the flow. Important lesson for crossing running water: don’t worry so much about the deep and wide, avoid the fast and narrow! Devin didn’t have the luxury of keeping his boots on for the creek crossings: his soles were being held on by glue and duct tape. 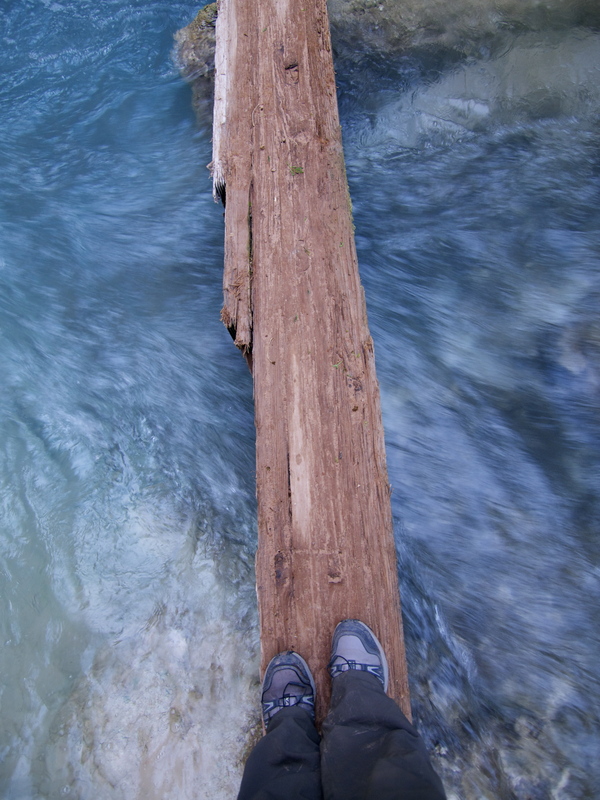 Next time, we’ll bring water shoes, a dry bag for my camera and a pole to help steady our steps. Live and learn. 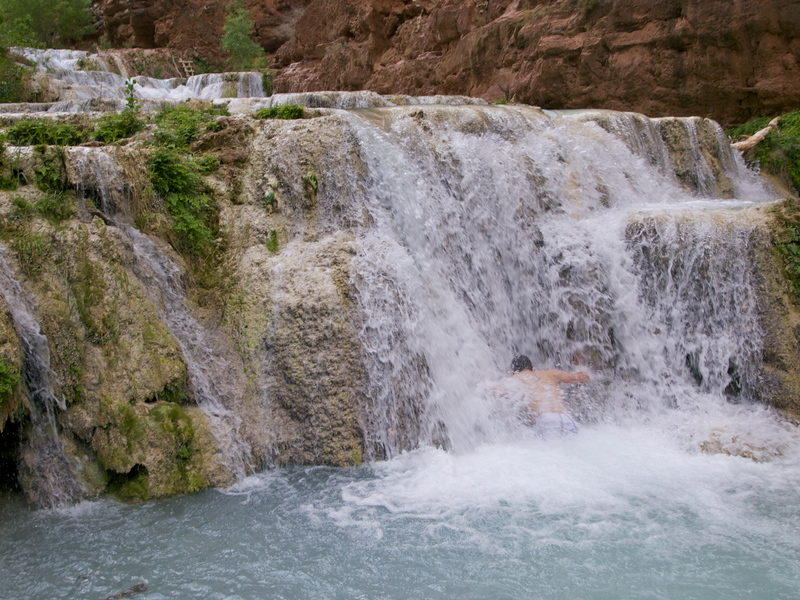 Soon we came to Beaver Falls, the last major falls along Havasu Creek, about three miles downstream from End Falls. Beaver isn’t as tall as Havasu Falls or End Falls, but it’s more intricate, with many frothy drops into blue pools. I went wading and Devin went swimming and after an hour of having the place to ourselves, we both declared Beaver our favorite falls. Past Beaver, the trail got even harder to follow and we spent a good hour tracking the route through tunnels, over cliffs, down ladders, and across ledges. We crossed the creek at least ten more times, with Devin removing and relacing his boots each time. The last mile was a tease of anticipation as fresh riparian wind from down canyon carried news of a big river ahead. Each bend in the canyon walls looked like it might be an opening, but each time the high walls closed in for another turn. Finally we passed three rafters who had come up from the river – the first people we’d seen all day – who assured us the end was near. Five hours after End Falls, we came to the confluence, where the vivid blue waters of Havasu Creek sweep into the brown rush of the mighty Colorado River: the end of Eden. 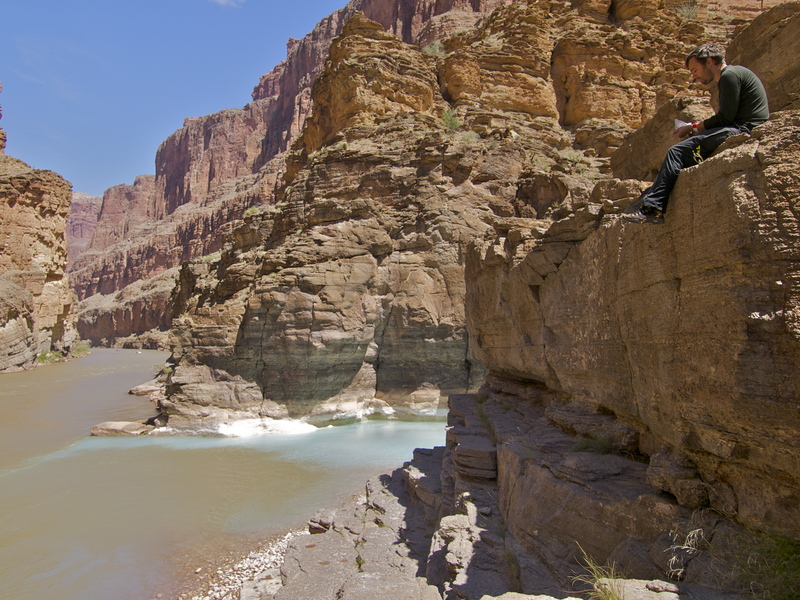 I took off my wet shoes and socks, put them in the sun to dry and sat down to stretch on the smooth, warm Muave Limestone that forms the basement of this part of the Grand Canyon. The limestone was lovely, but I missed the striking black and pink Zoroaster granite that lines the Colorado River farther upstream. 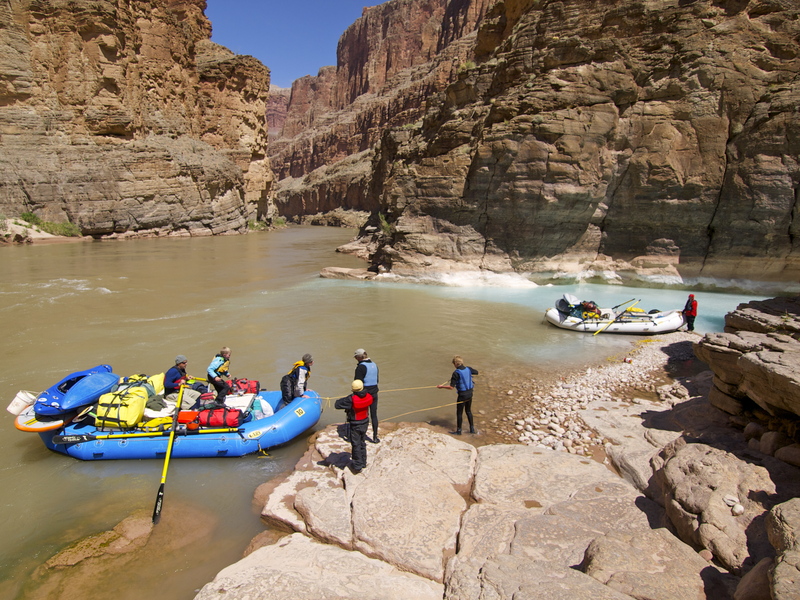 Two more rafts showed up, handily negotiating the tricky turn into the outlet of Havasu Creek. I went down to talk with them and the leader asked me about the permit process for hikers. I told him I had gotten permits for our trip three weeks ago. He laughed and said he had applied for his rafting permits in 1995! I’d rather arrive here on my own two feet anyway. Stay tuned for another post on our dramatic exit from Havasu. Hint: we took a form of transportation I’ve never tried before! 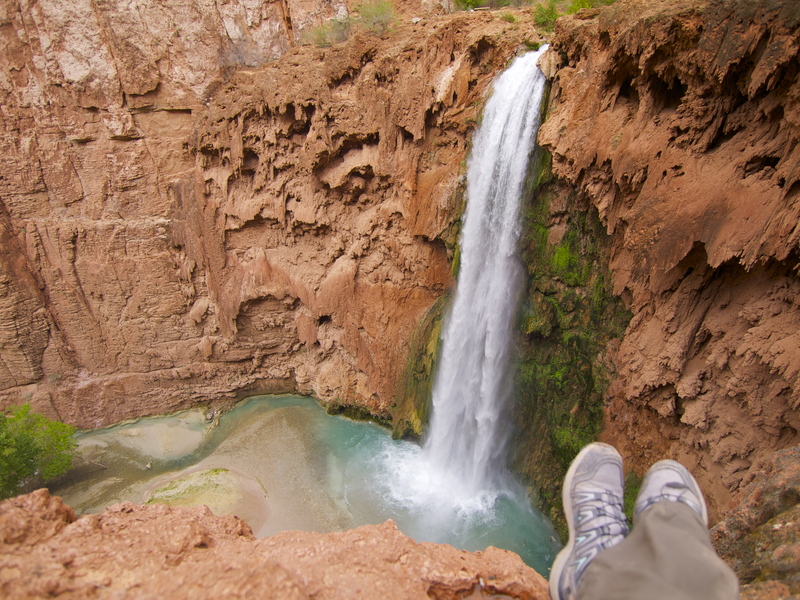 This entry was posted in Hiking!, Photography, Uncategorized, Vagabonding 101 and tagged Colorado River, confluence, Havasu Creek, Mooney Falls. Bookmark the permalink. Thank yo for that because I will NEVER be doing it myself. Your photos are amazing. 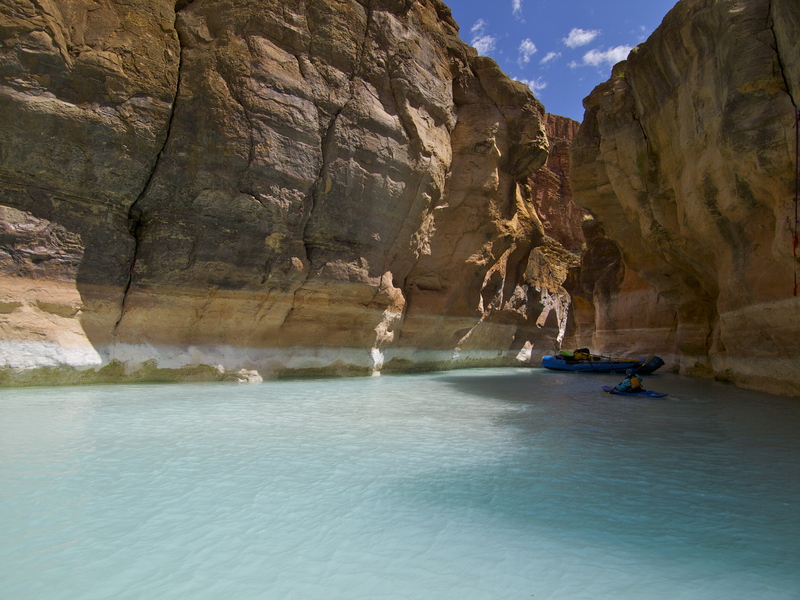 Can you get to the Havasu creek without the terrifying trail to get there – ie by water? You can get to Havasu via the Colorado River. Those are how the rafters in Mary’s pictures got there. 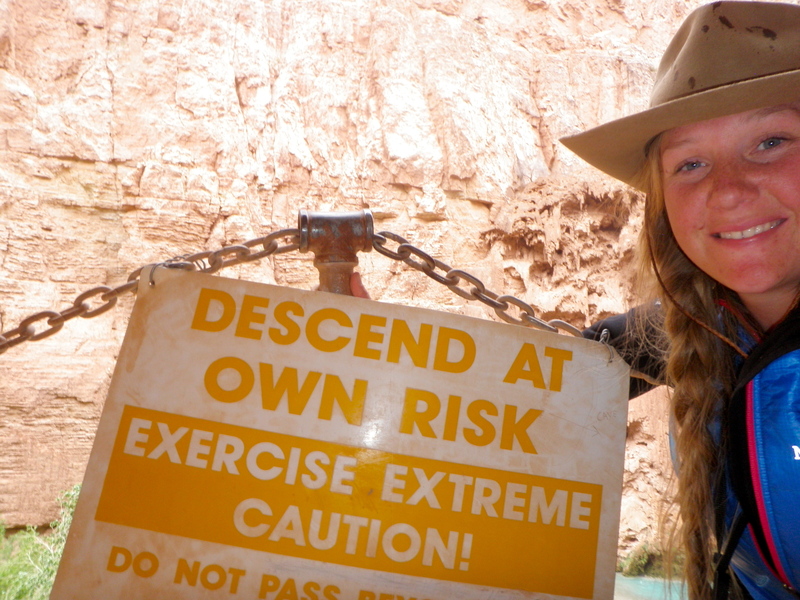 However, it appears easier to get a hiking permit than a rafting permit. Rafting permits are done on a lottery basis. If you want to go during the prime months, it may take years to win a private permit via the lottery. If you don’t mind going Nov-Feb, chances are pretty good you might get a permit your first year trying. There are also commercial trips available and those are easier to get, but you’ll pay heavily for it. I’ve been there twice via the river. It’s one of the special spots in the Canyon, in my opinion. What I didn’t know until Mary’s trip, was if you could get there by foot. Sounds like going via the river might actually be the safer route! Mary, thanks for the post. thanks for all the intel, Dan. There is utterly no way I would get through that hike alive so it’s the river or the never for me. yes, what a great post, but I don’t think at my age I could make it down that wall either, is there another way? Amazing set of pics though! Very cool! Looks like an amazing trip! After reading your blog for several months, I took the plunge today and bought a teardrop trailer. The plan is to hit the road at the end of May when my lease is up! WOW ! What a fantastic adventure would love to do that ( If I had the nerve now) Thank you for such superb photo’s Which I will print and frame and hang in my study if that’s O.K. with you Mary. Oh My, the color of that water in the pic at the end of the Havasu was amazing !!!!! Thanks so much for sharing your pics and adventures with me. Your blog is very informative. 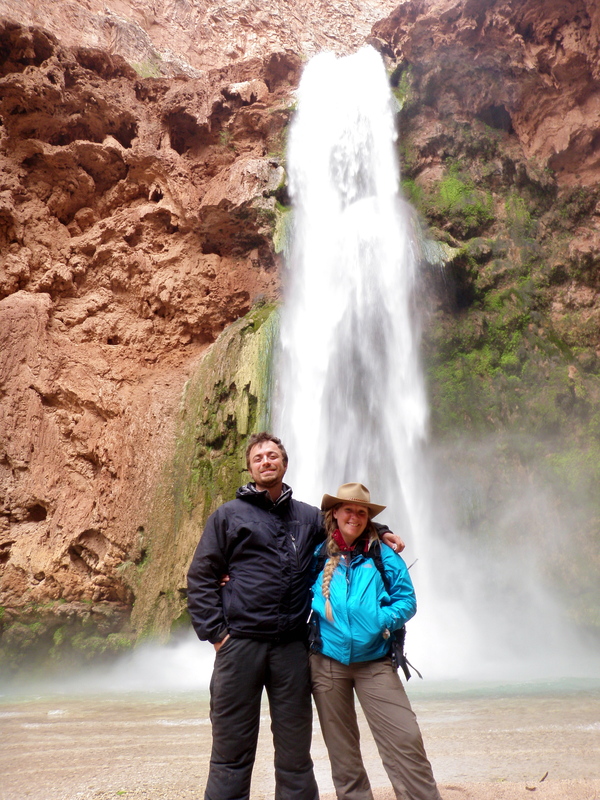 I am planning to do havasupai campground to colorado river hike on June 1st. 1. How long did the two way trip take for you ? I am trying to figure out when to start – 6am/7am/8am. 2. What type of footwear did you use or you recommend ? 3. Most importantly, is there a trail map ? Are there pointers to key “confusion points” 🙂 ? Blondecoyote, you know of course that the floods of 1995 and 2001, 2006 have left this much changed than before. It should be noted in your blog that many of the travertine ponds are gone and Mooney falls is but a drivel of its former self. Many people still see these OLD photos, and should prepare for a disappointment, or change of plans. I do not go there anymore, it is just not that great now. Thanks, Larry. These photos are from this past spring- April 2013. Wow! Your post is a great place to get useful info aboit this hike. I thank you for sharing this!! Amazing trip! We’re going in 3 weeks and we’ve always been curious how to get to the Colorado! Hmmmm, we may do it.